It's probably been a little tough to be a DC Extended Universe fan this week. Not only did we find out that The Flash is getting a page-one rewrite, which means the movie is almost certainly being delayed, but it was also revealed that Ben Affleck won't be directing The Batman, which was something everyone was really looking forward to. 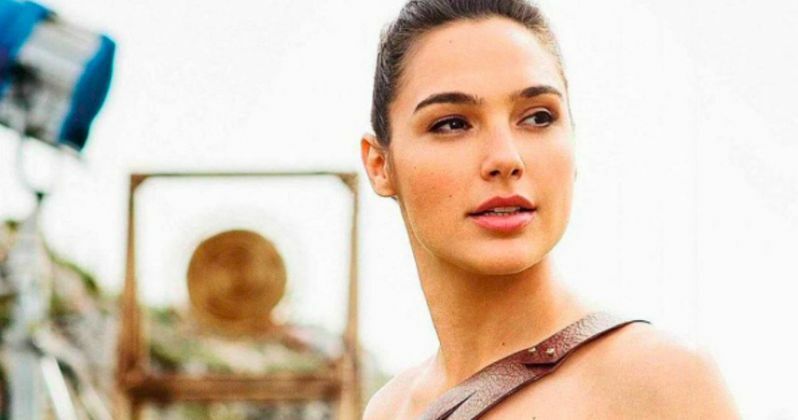 Leave it to Gal Gadot to come in and save the day, because the actress has just shared a brand new image from Wonder Woman. The actress shared the new Wonder Woman image on her Instagram and simply captioned it with a few heart emojis and #WonderWoman. The image features Gal Gadot wearing the gold Wonder Woman suit, which is something we previously saw in a photo released by Entertainment Weekly that saw Diana Prince stealing the Godkiller sword. This is likely going to be the outfit we see Diana Prince wearing in the earlier parts of the movie before she joins up with Steve Trevor (Chris Pine) to help save the world. Wonder Woman has never had her own live-action movie, so expectations are very high. Batman V Superman: Dawn of Justice divided fans and failed to land with most critics, but Gal Gadot as Wonder Woman was generally considered to be one of the highlights of the movie, which has helped fuel anticipation for her first solo adventure in the DCEU. Here is the official synopsis for Wonder Woman. "Wonder Woman hits movie theaters around the world next summer when Gal Gadot returns as the title character in the epic action adventure from director Patty Jenkins. Before she was Wonder Woman, she was Diana, princess of the Amazons, trained to be an unconquerable warrior. Raised on a sheltered island paradise, when an American pilot crashes on their shores and tells of a massive conflict raging in the outside world, Diana leaves her home, convinced she can stop the threat. Fighting alongside man in a war to end all wars, Diana will discover her full powers...and her true destiny." While it may be unfair, Wonder Woman is now having to bear the burden of course correction for the DCEU, since it is the next DC Comics-based movie Warner Bros. is releasing. Both Batman V Superman: Dawn of Justice and Suicide Squad were panned by critics and didn't find the level of adoration from the general public that the studio was hoping for. Plus, with projects like The Batman and The Flash seemingly on uncertain ground, the studio could really use something to provide some encouragement and extinguish any negative conversation surrounding the DCEU. There haven't been any official screenings held for Wonder Woman yet, but there have been conflicting reports, with some saying it is a disaster and others saying the first cut of the movie is good. Either way, we'll know for ourselves in just a few short months. It may not be much, but this new Wonder Woman image is something positive for DC fans to latch onto right now. The movie is being directed by Patty Jenkins and stars Gal Gadot, Chris Pine, Robin Wright, Connie Nielsen, David Thewlis, Elena Anaya, Danny Huston, Ewen Bremner and Lucy Davis. Wonder Woman is set to hit theaters on June 23. Be sure to check out the new image from the movie for yourself below.